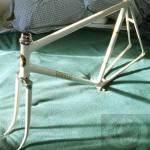 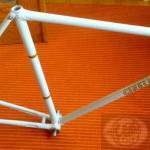 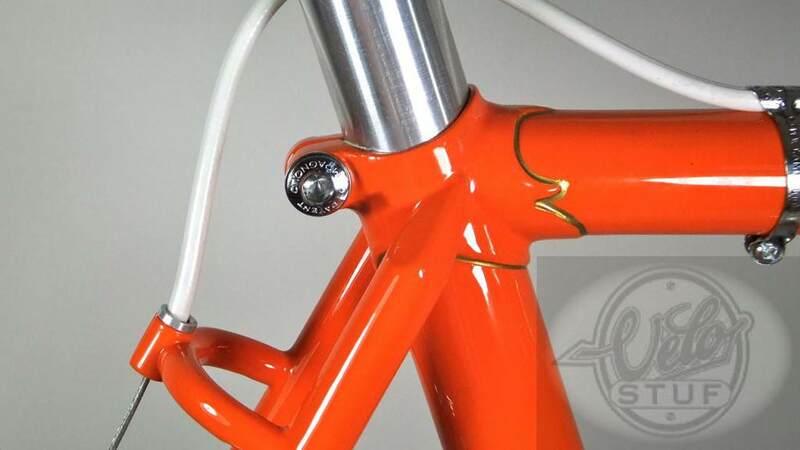 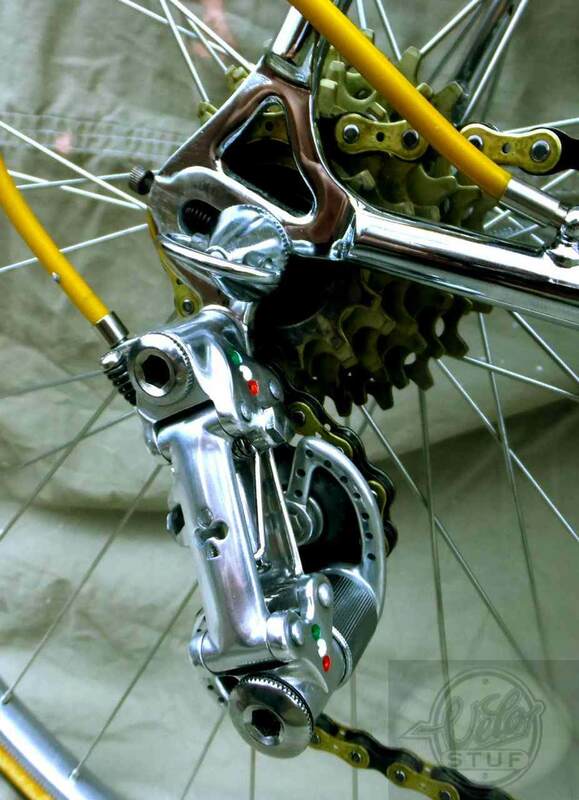 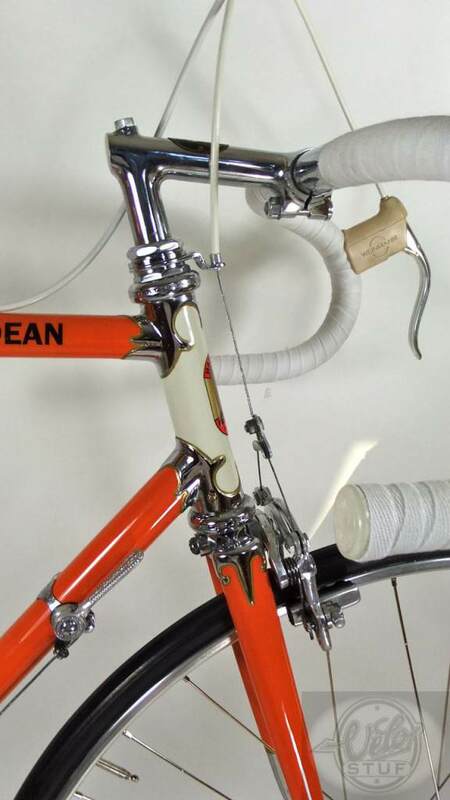 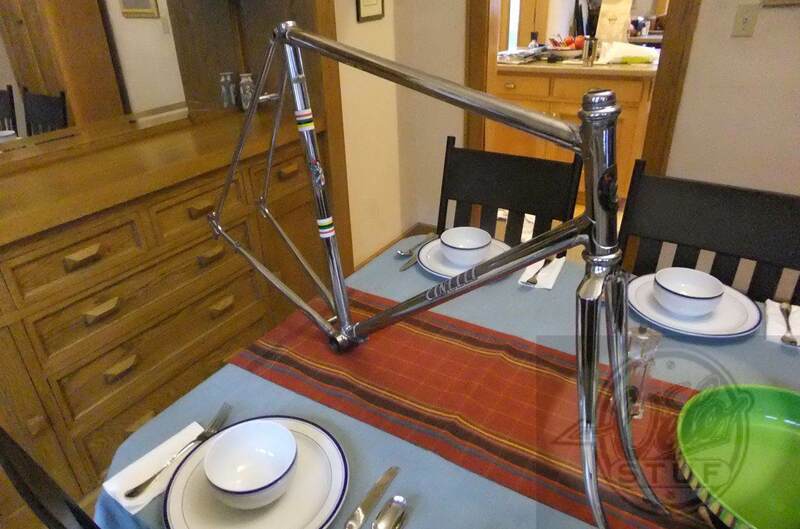 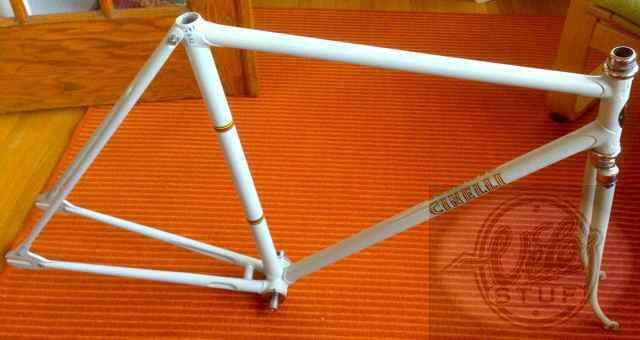 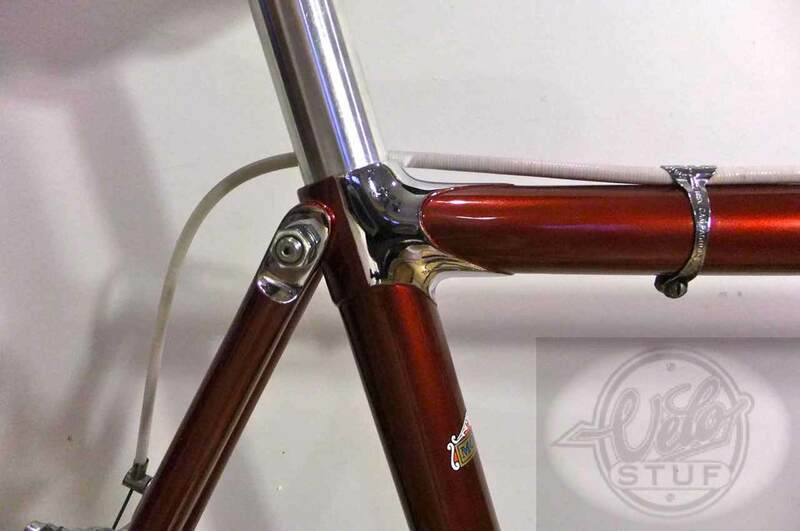 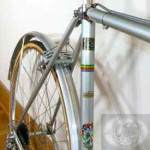 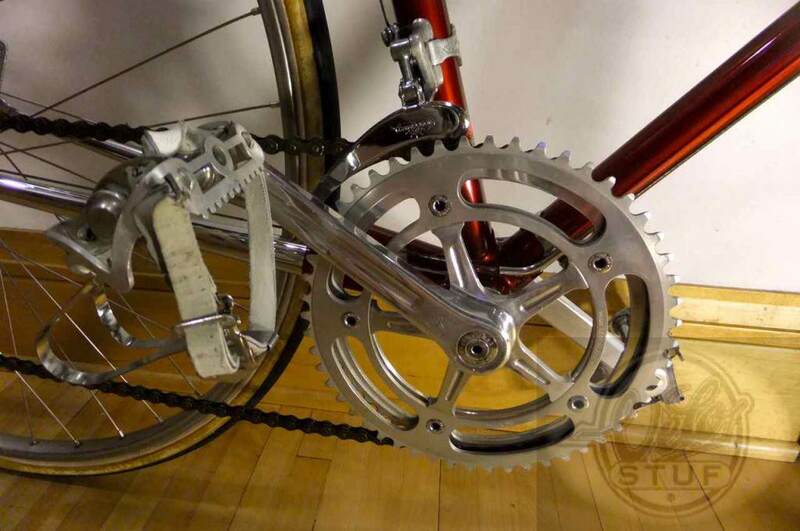 This track frame was made for and raced by the Italian National Team. 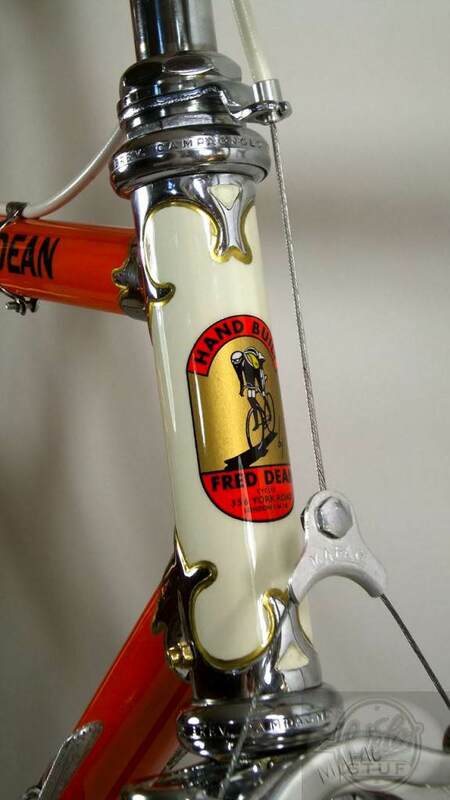 It was repainted in the early 60’s and not used since. 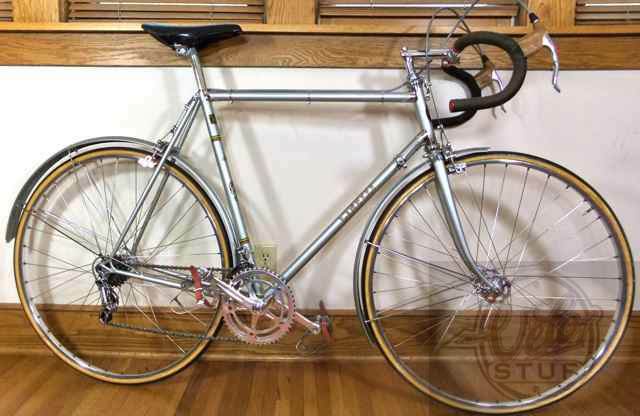 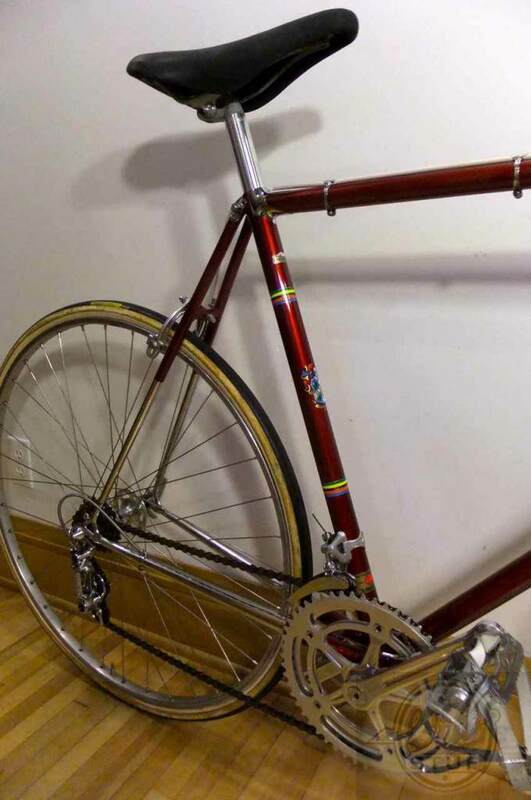 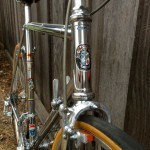 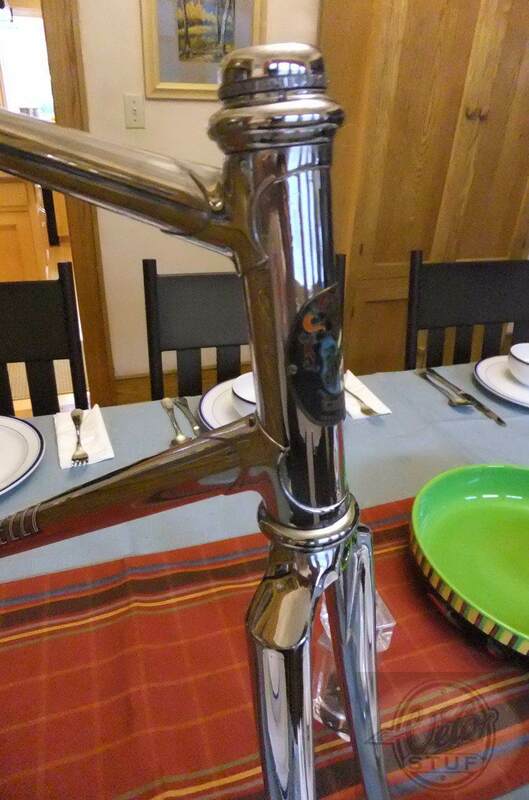 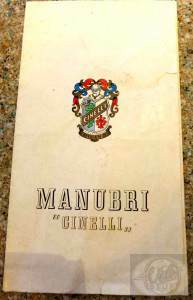 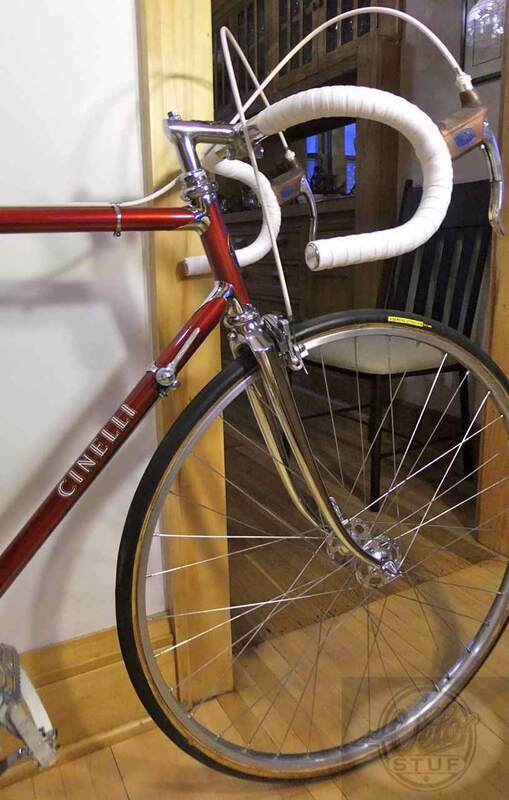 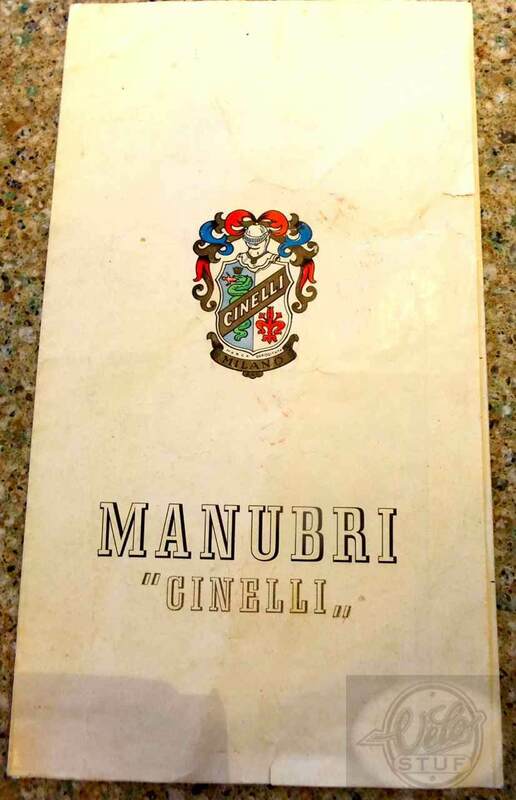 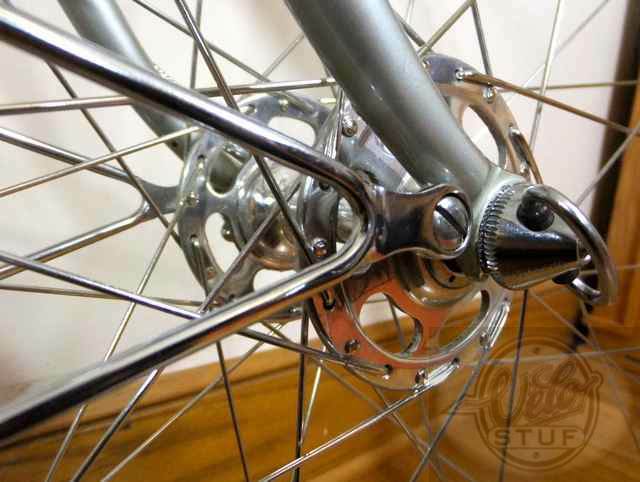 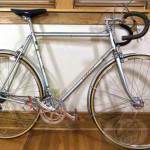 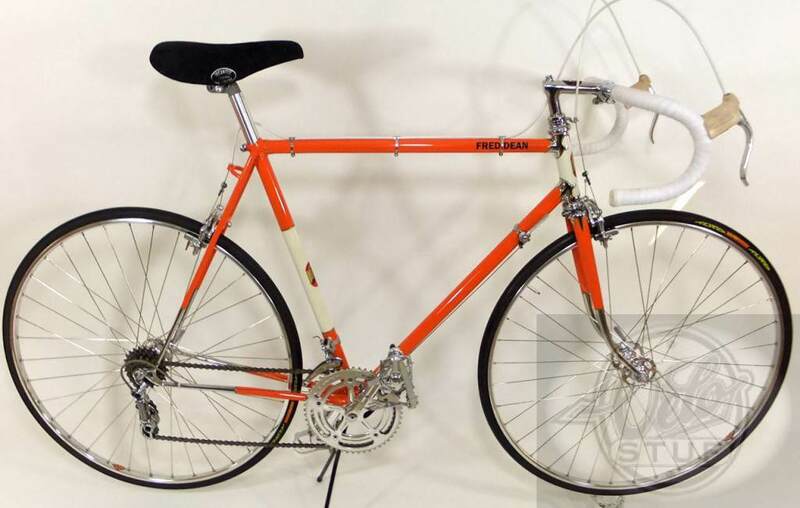 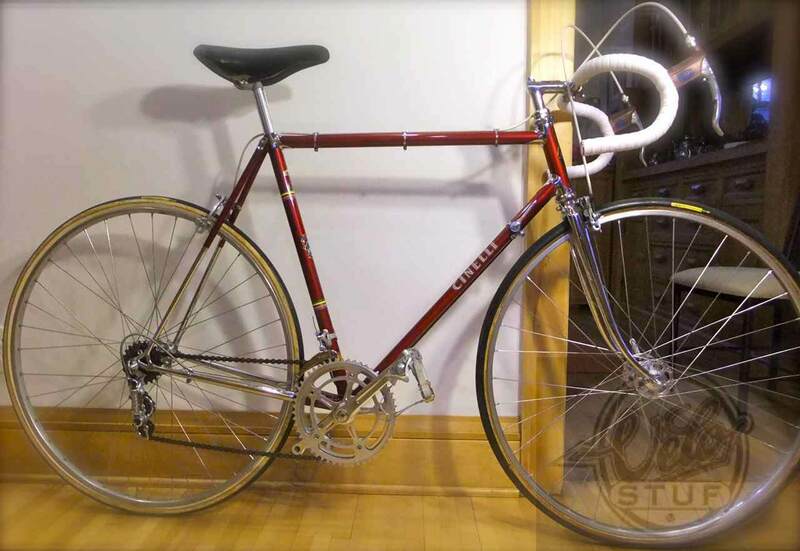 100% original c. 1961 Cinelli SC road bike in excellent++ condition. 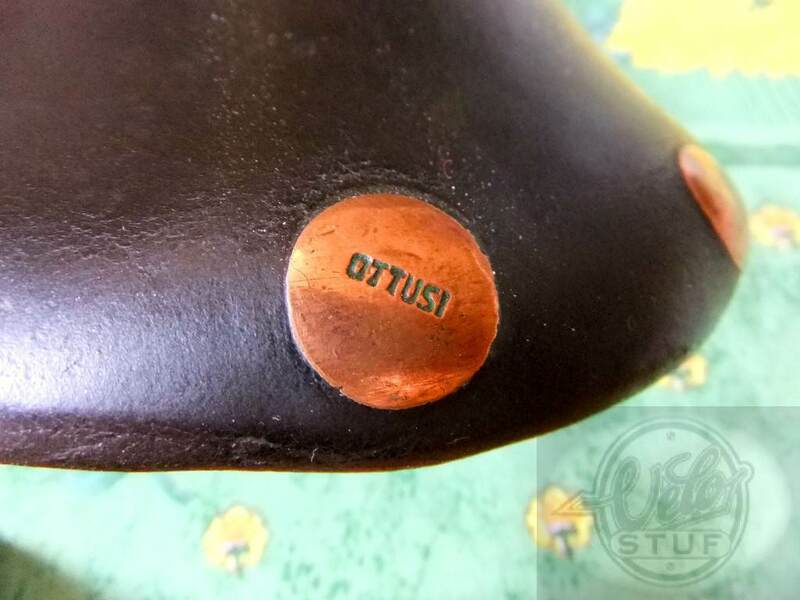 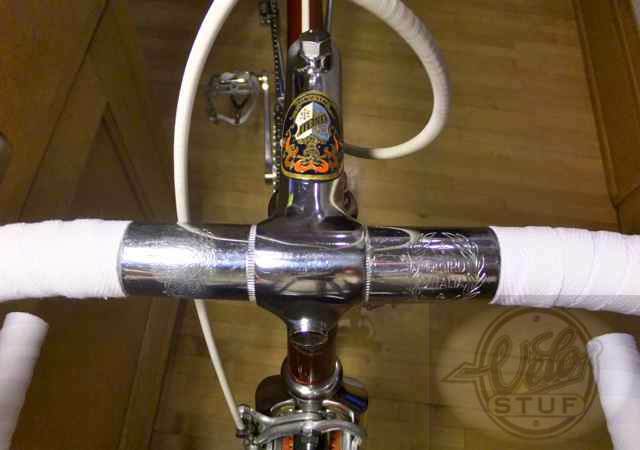 Rare, or valuable headset (or bottom bracket) parts that are in lousy condition can be worth spending some time on to regrind. 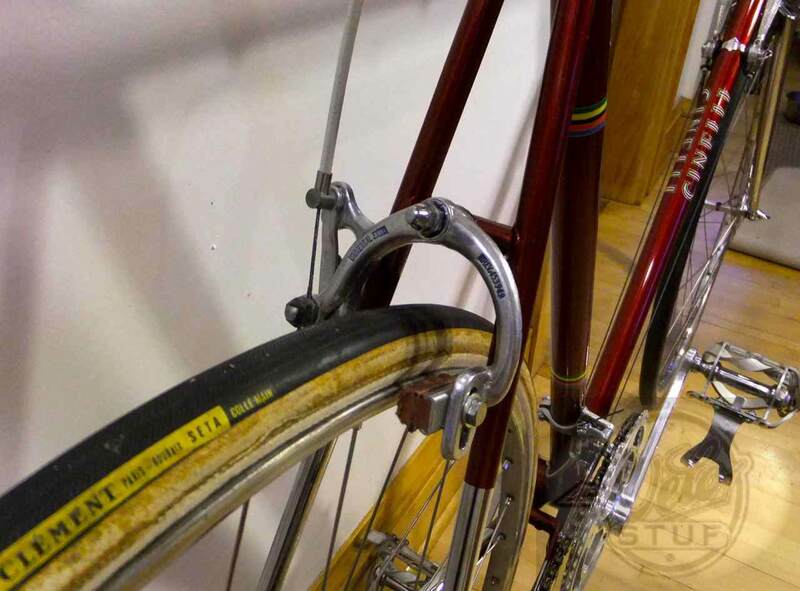 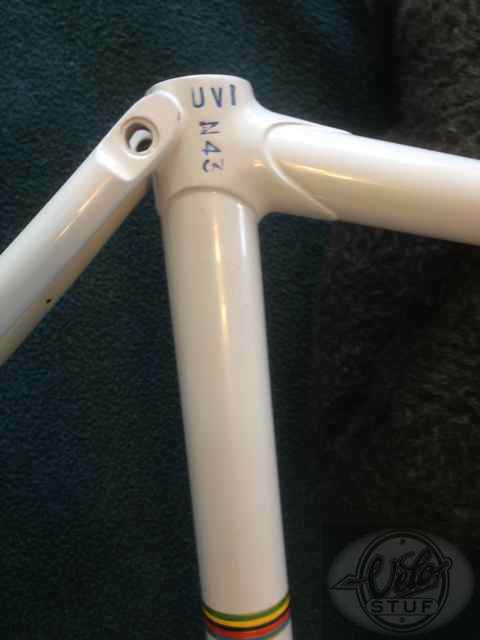 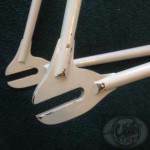 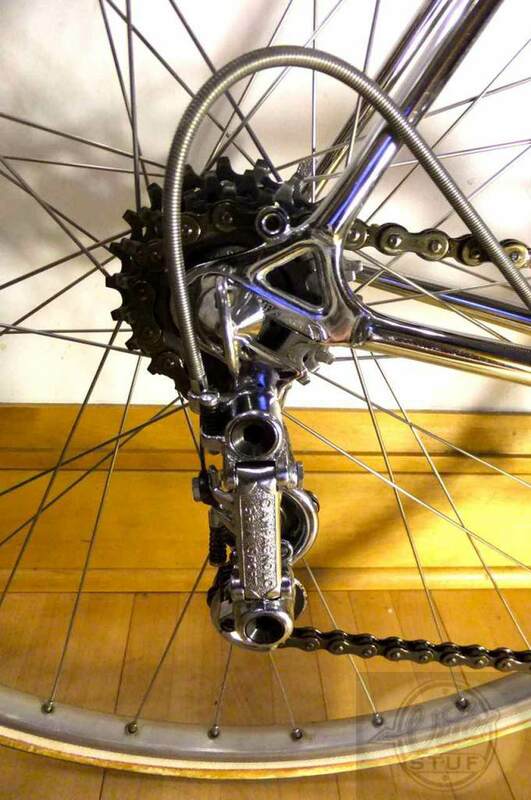 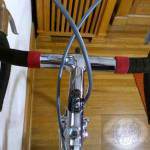 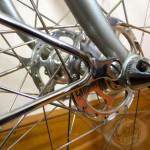 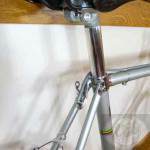 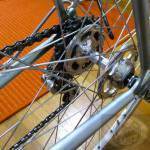 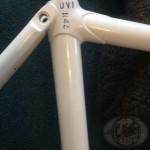 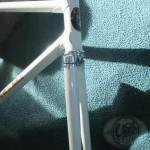 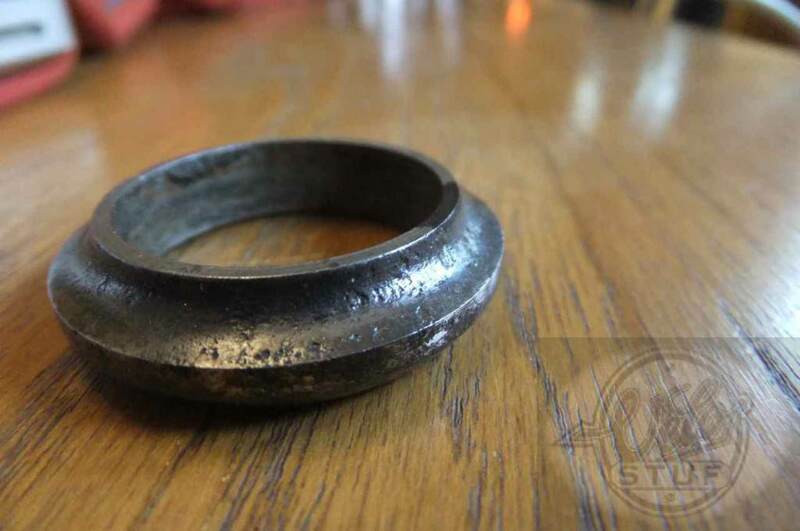 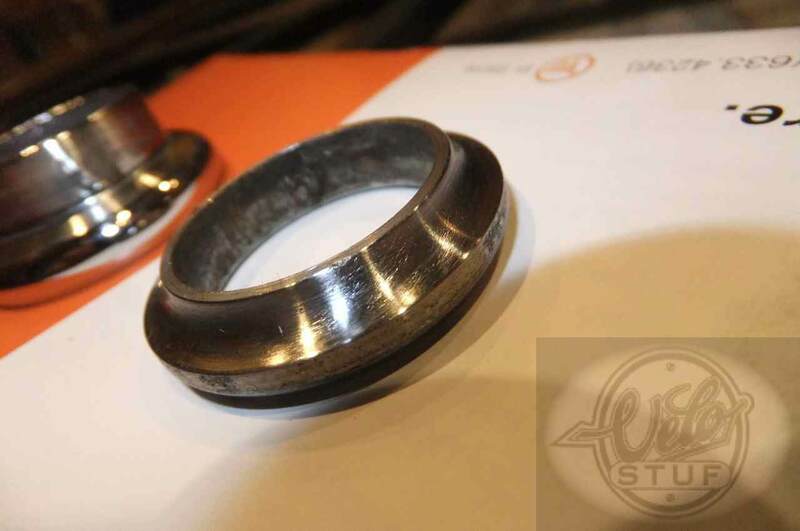 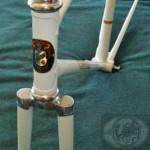 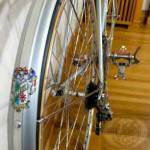 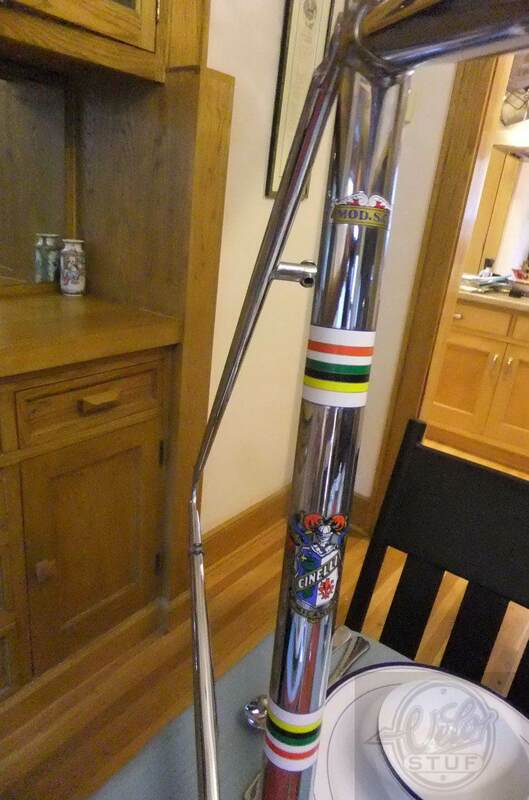 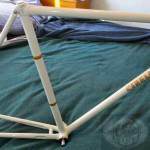 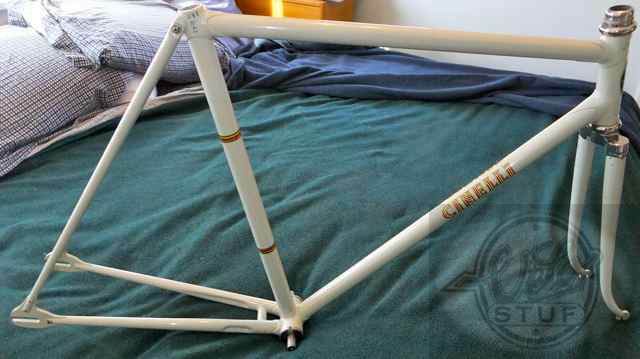 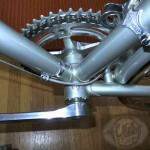 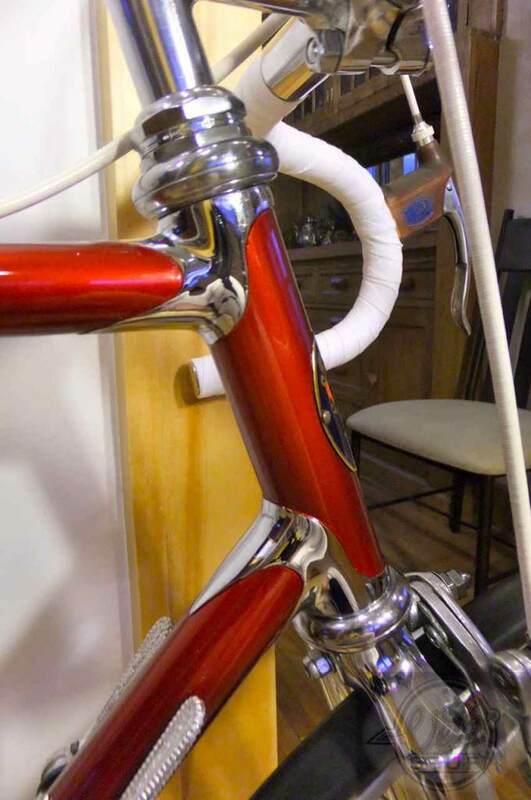 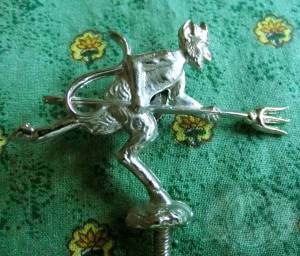 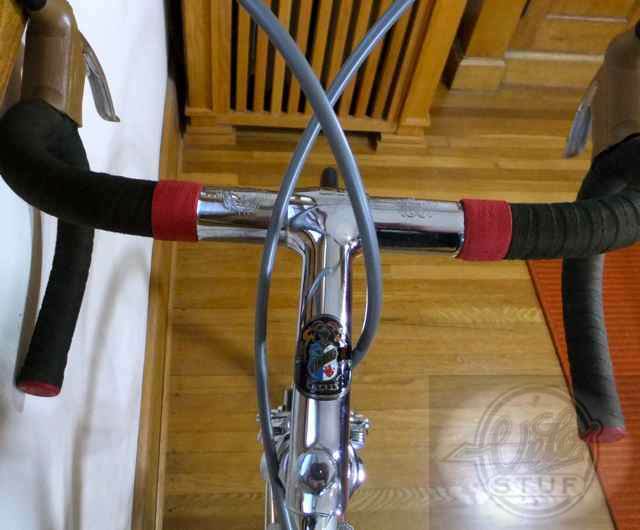 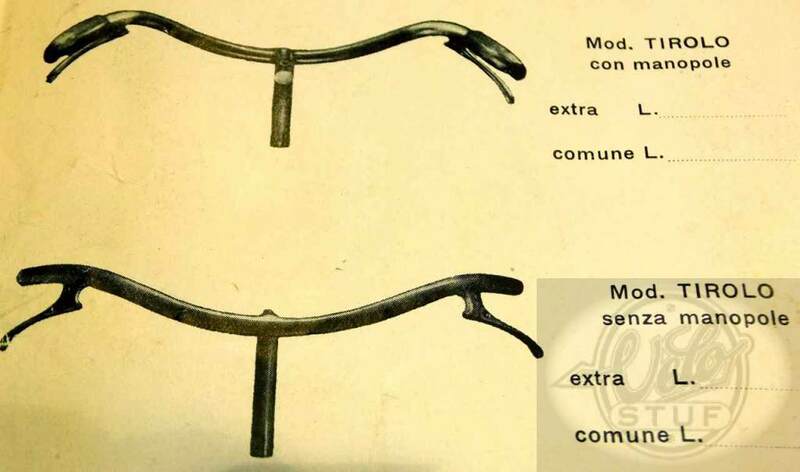 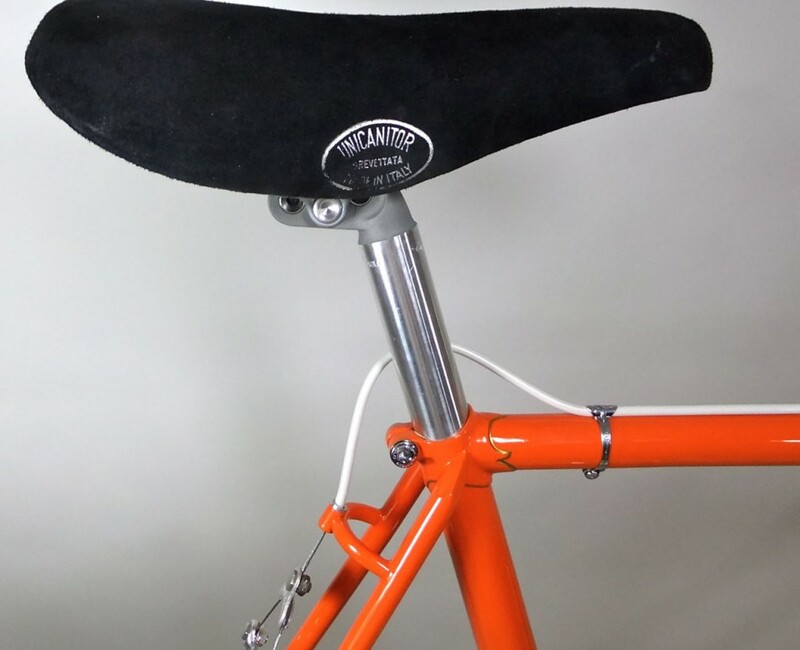 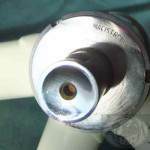 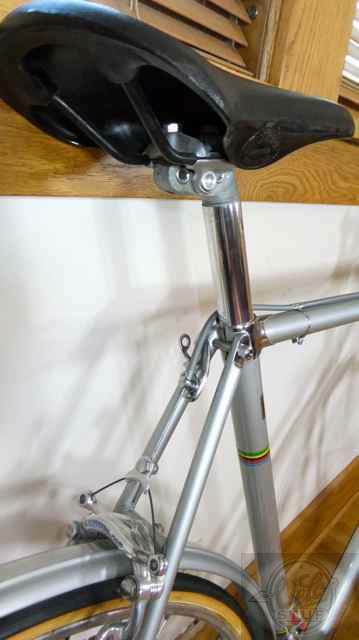 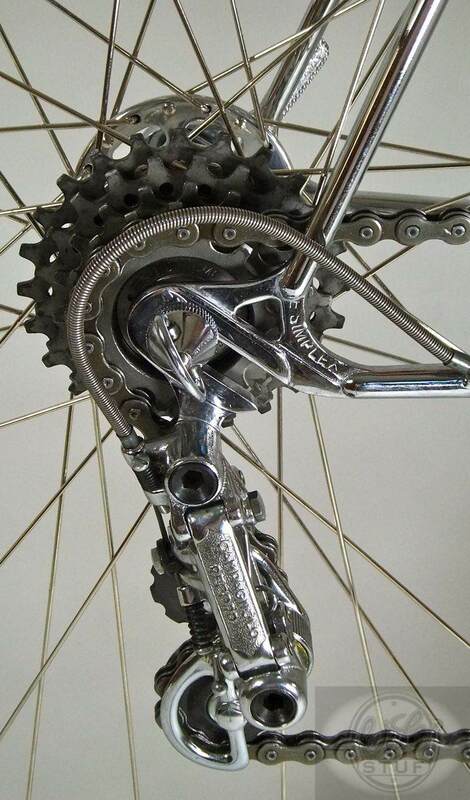 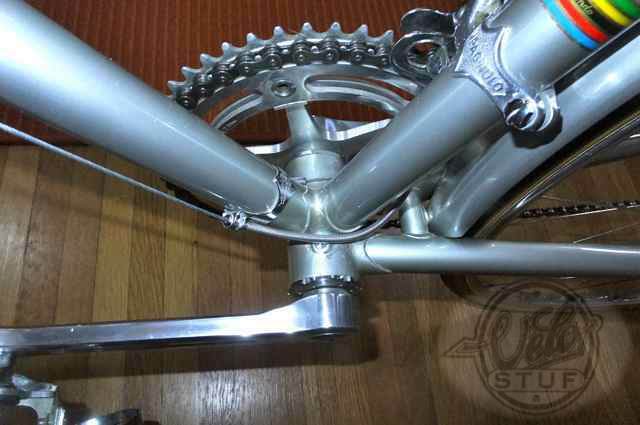 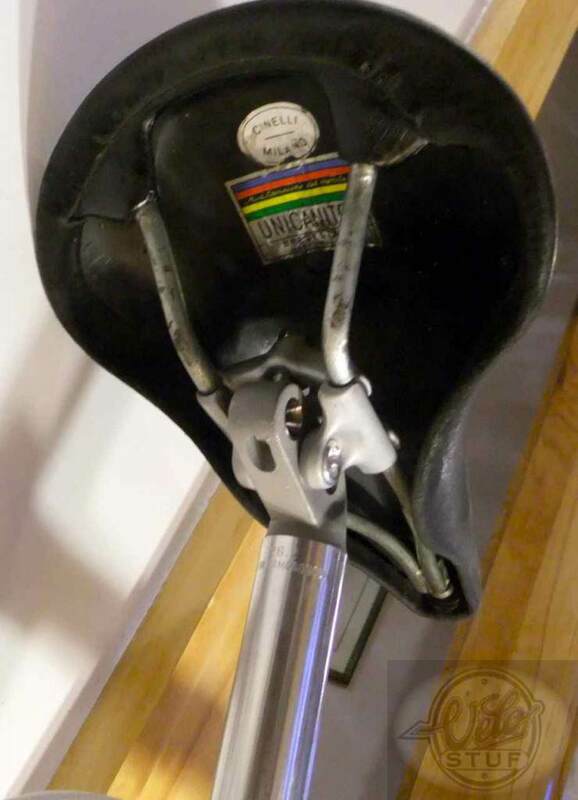 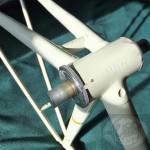 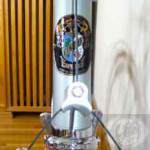 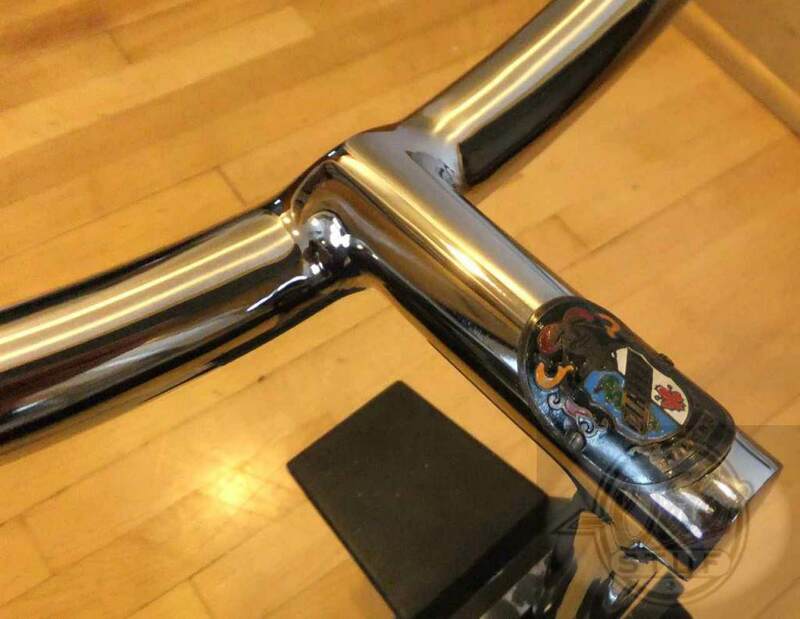 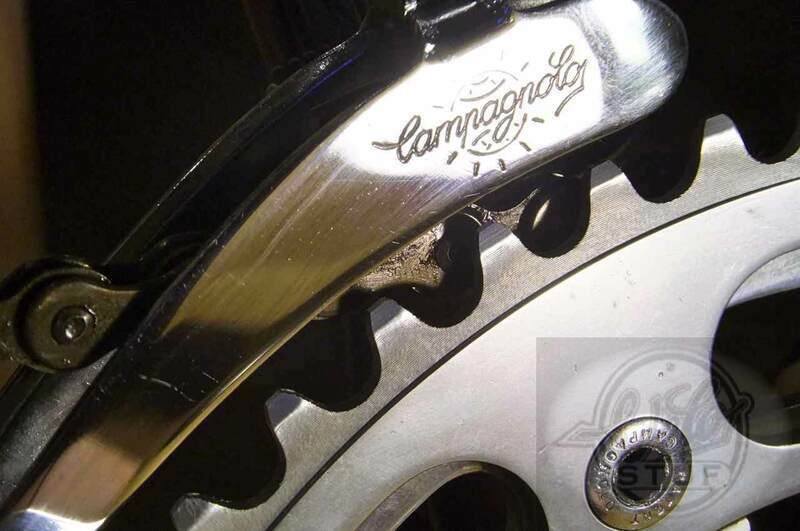 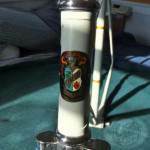 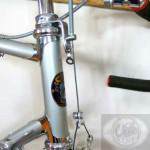 Here is a headset fork crown race from a Cinelli headset that needs help. Using a small metal lathe and a Dremel tool, I have figured out how to bring it back to life. 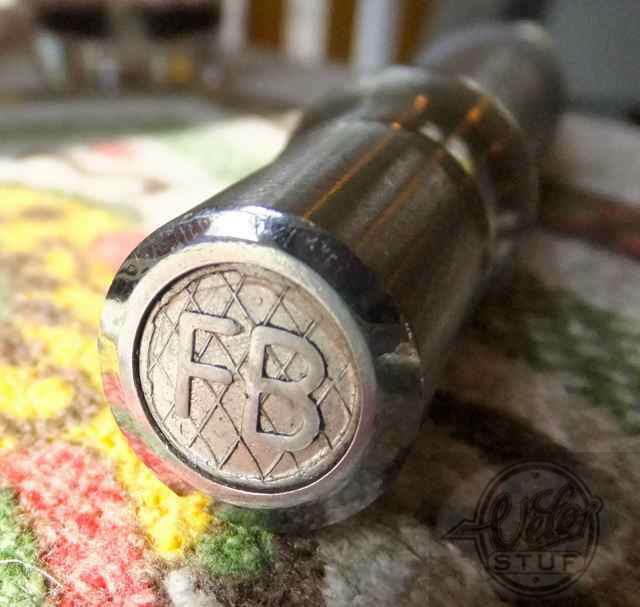 I acquired a small mini-lathe from Harbor Freight with the sole intention of refreshing parts like this that I have traveled around the world to acquire. 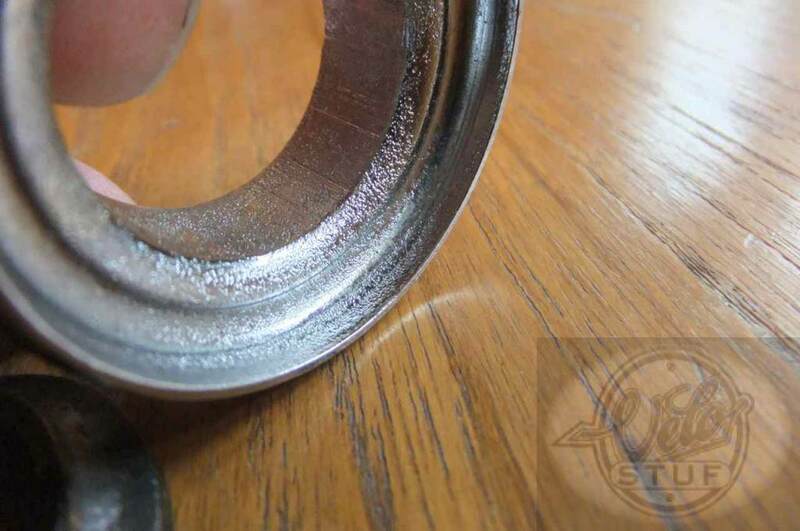 It’s simple in theory- lock-up the part in the lathe, and, using a Dremel tool with the appropriate grinding bit, or diamond bit, bear-down on the bearing surface as it spins to create a frsh, new, smooth surface. 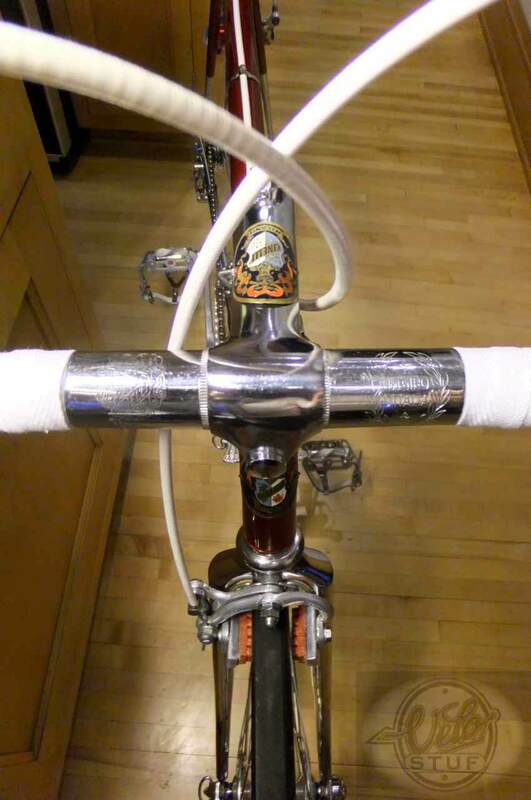 Good news- it works. 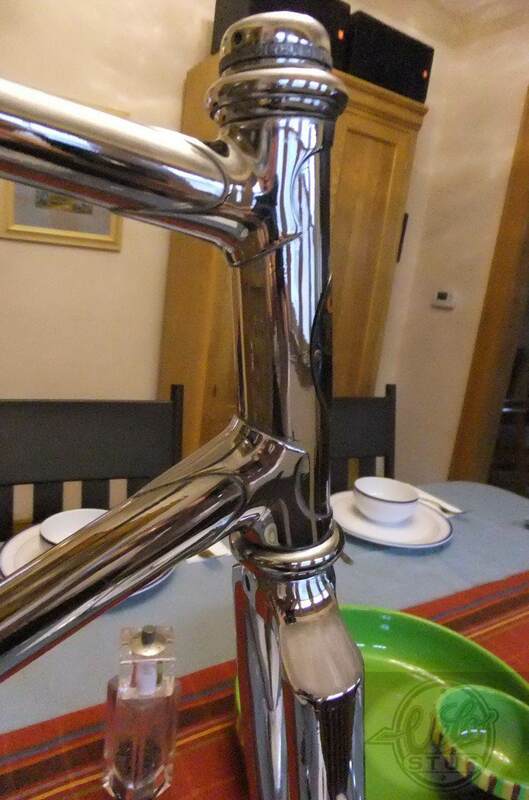 Bad news, it takes more work and time than I would have thought. 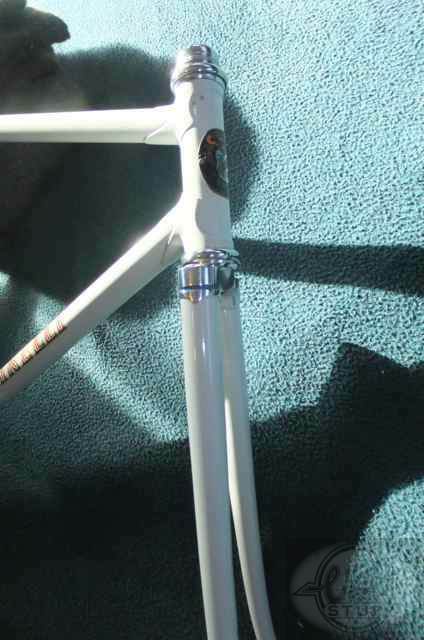 I used three different bits on the crown race and lower cup below. 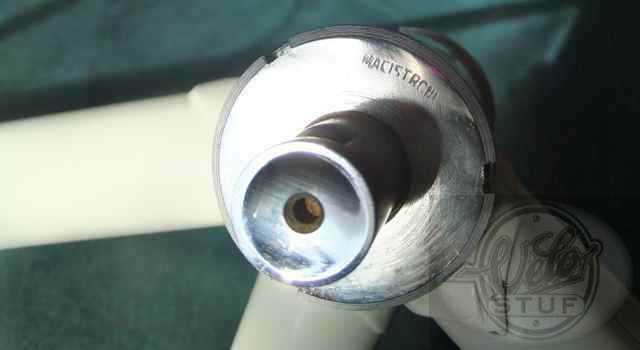 One was a round-ish green Dremel grinding bit, one was an orange torpedo-shaped Dremel grinding bit, and one was a round “diamond” cutting bit. After a surprising amount of time and effort with those bits, I finished with some sandpaper to give a slightly more smooth surface. 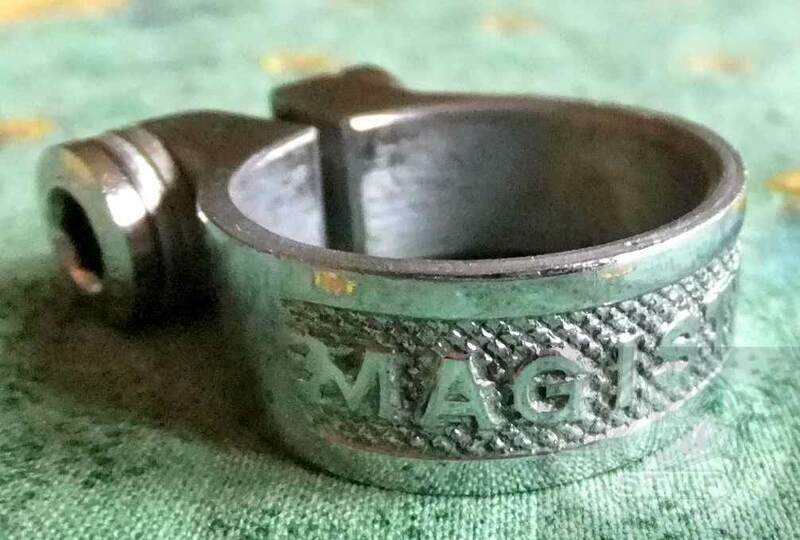 For these two parts, I spent about 1/2 hour. 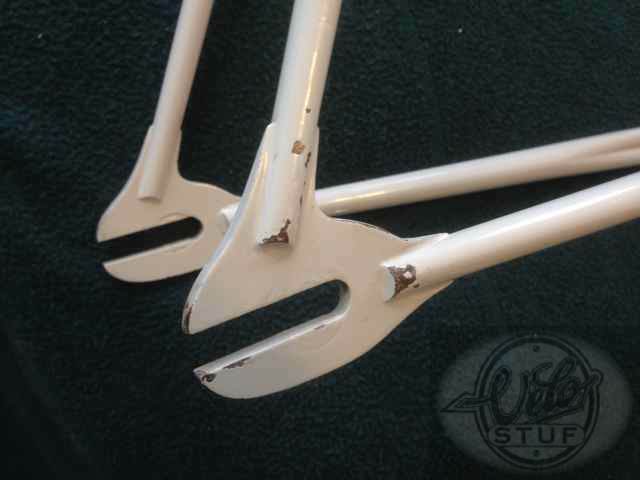 I easily could have spent another 1/2 hour making them marginally nicer. 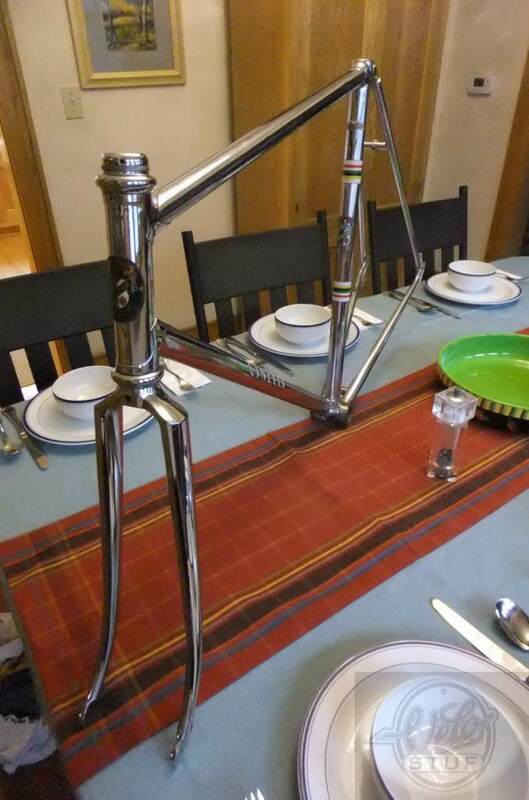 Each of the 3 bits was $5, and I probably ate through 1/3 – 1/2 of their lives, so after the $400 that I spent on the lathe, I spent $5+ on bits. 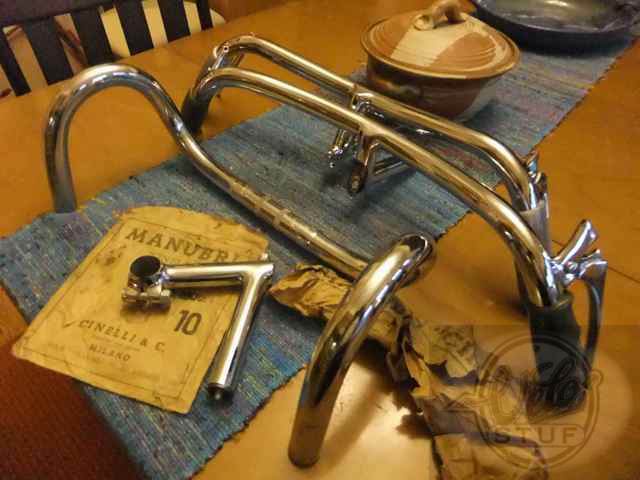 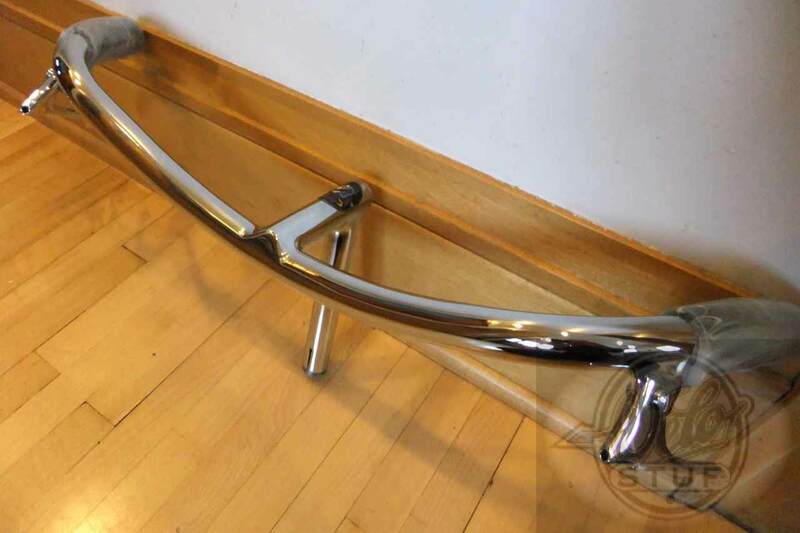 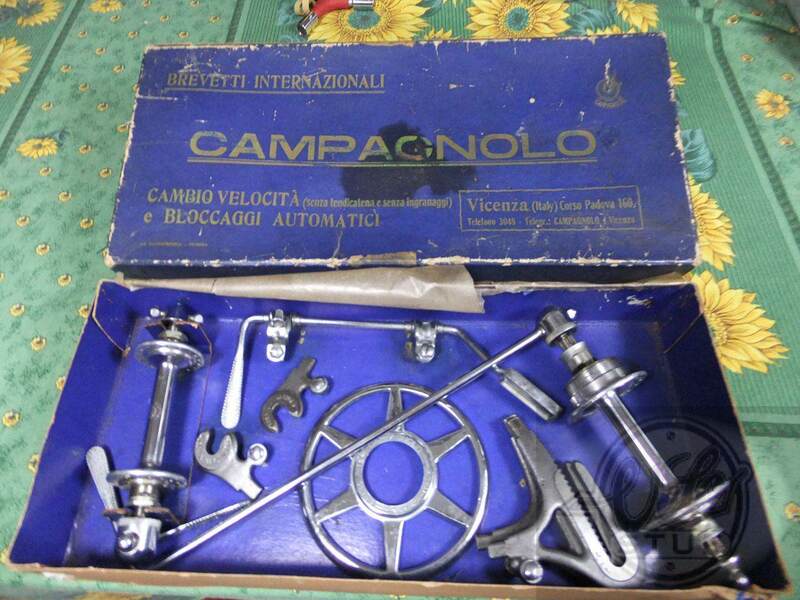 Could a guy start an enterprise regrinding parts for vintage racing parts like these? 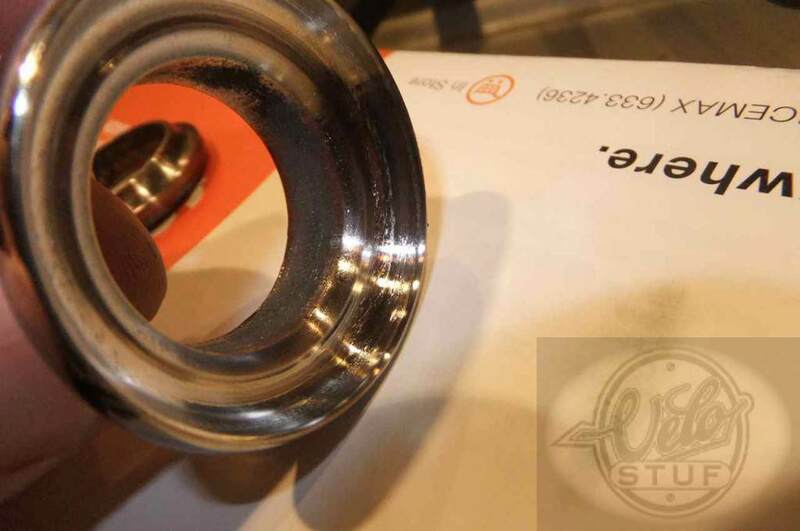 Yeah, but as much as I wish it could be done for $10 – $15 per part, and be profitable, (I’m looking for things to do in future retirement) it isn’t meant to be. 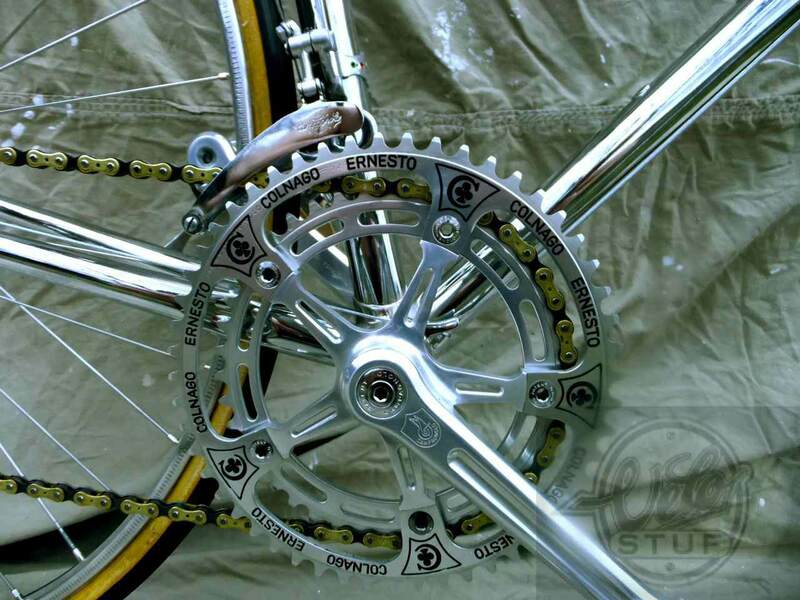 For me it makes sense because I really want the rare Cinelli and Campy headset parts for the bikes in my collection to spin smoothly, but the time and effort that I put into it is a good value to me only, probably. 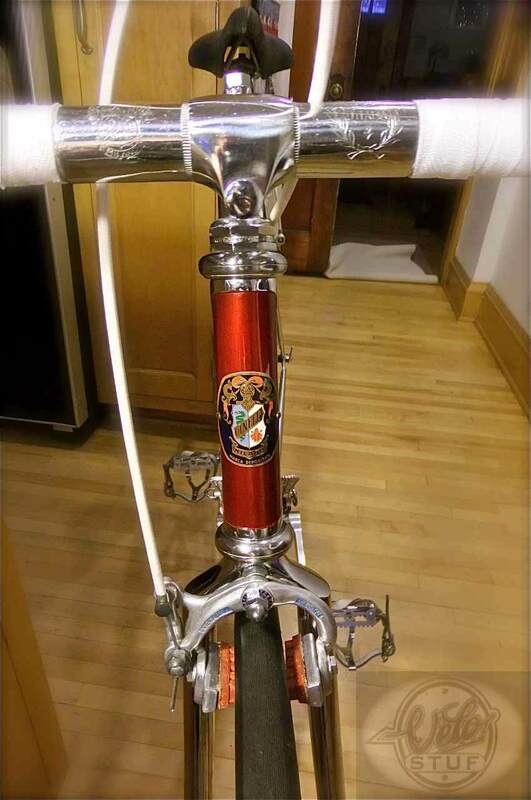 Is there another way to “skin this cat”? 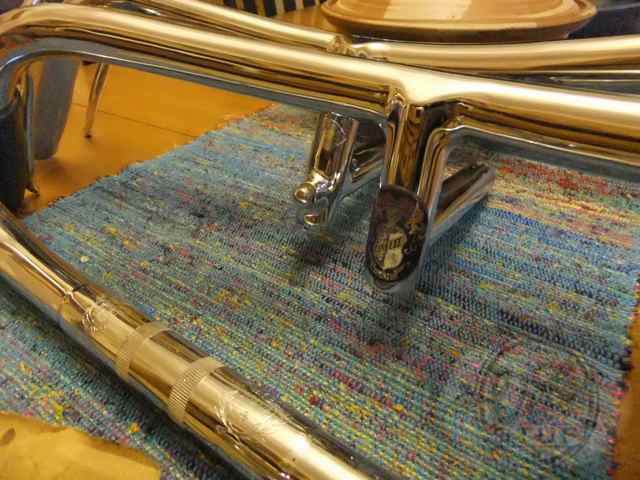 Probably, but this is the best that I can come up with for now. 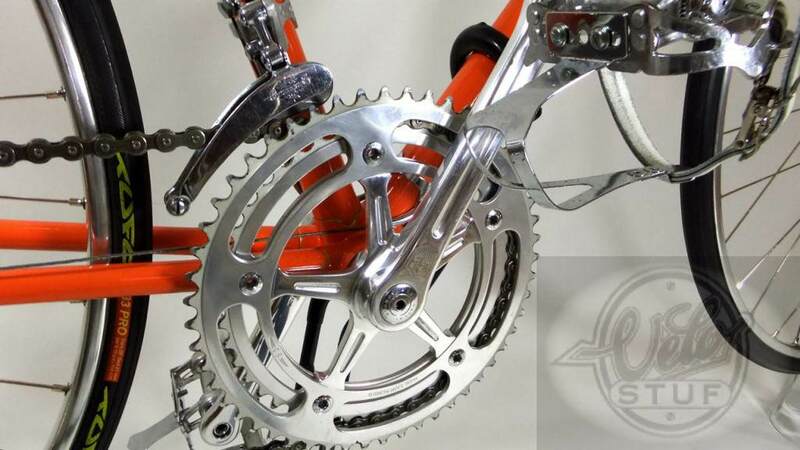 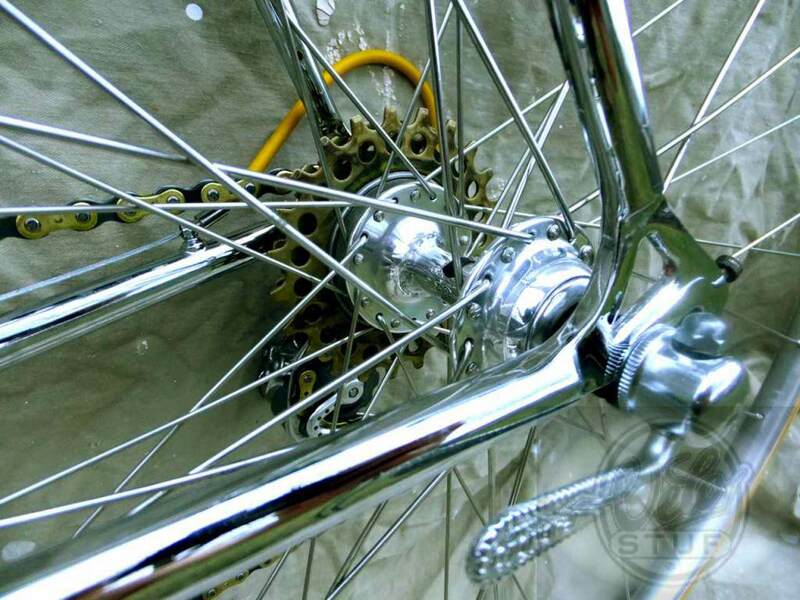 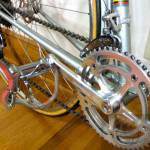 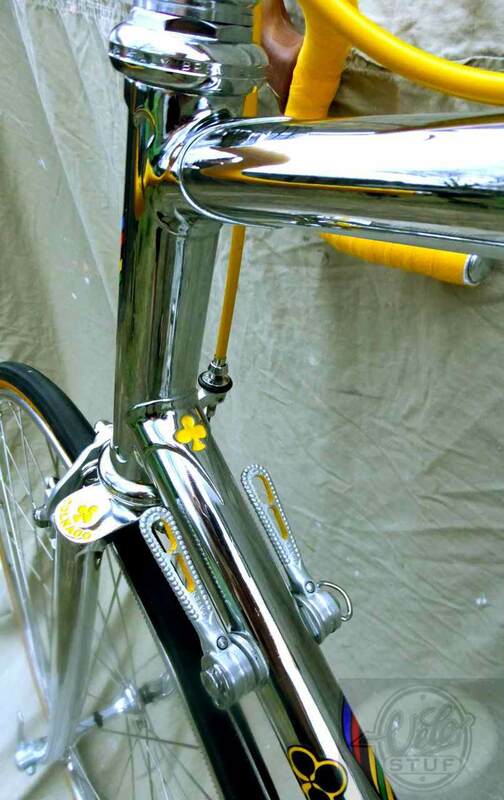 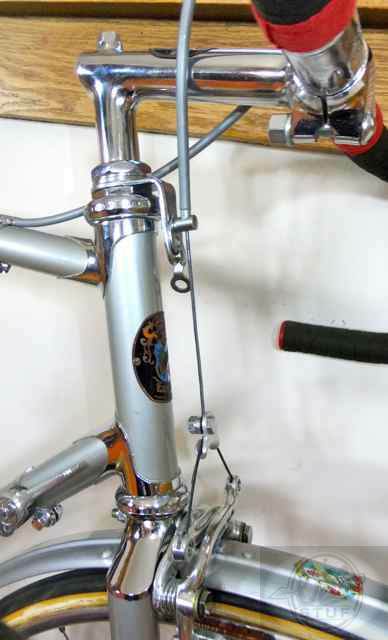 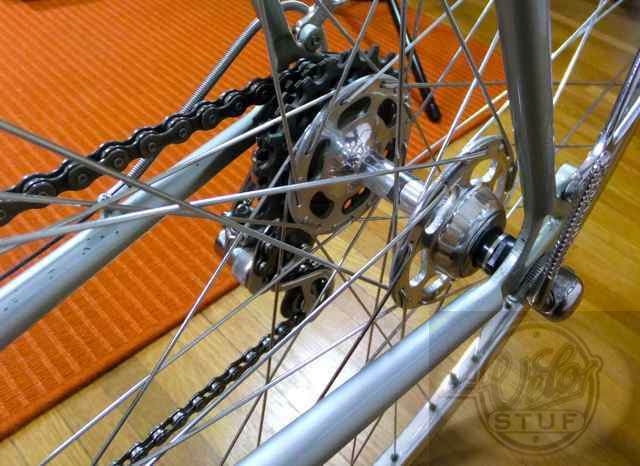 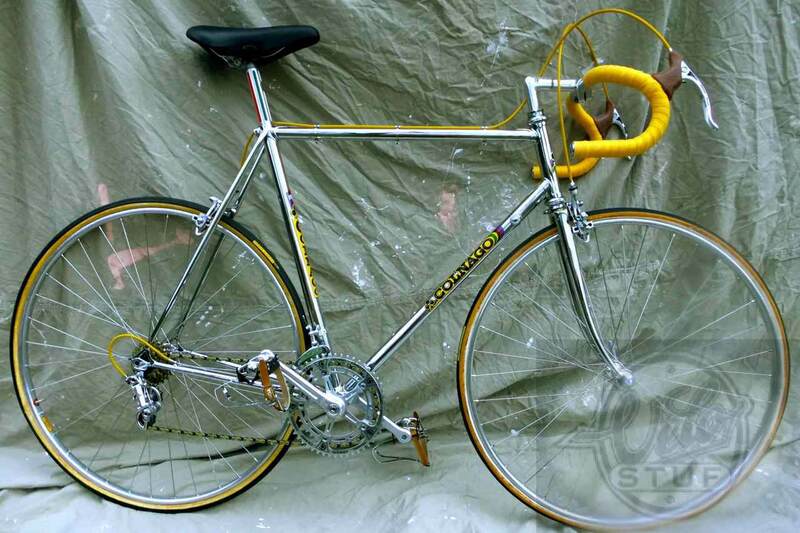 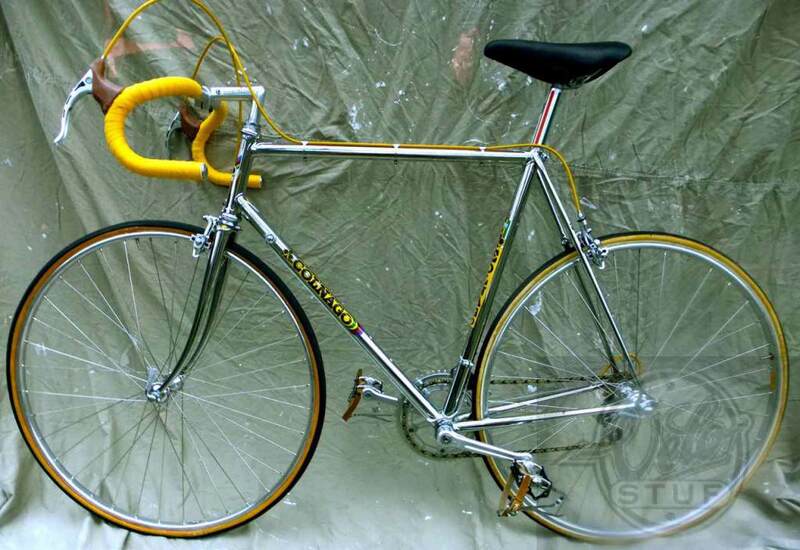 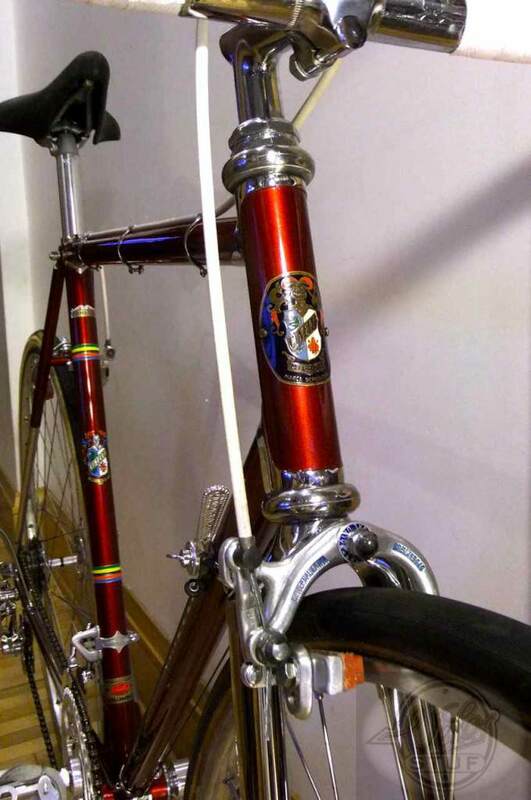 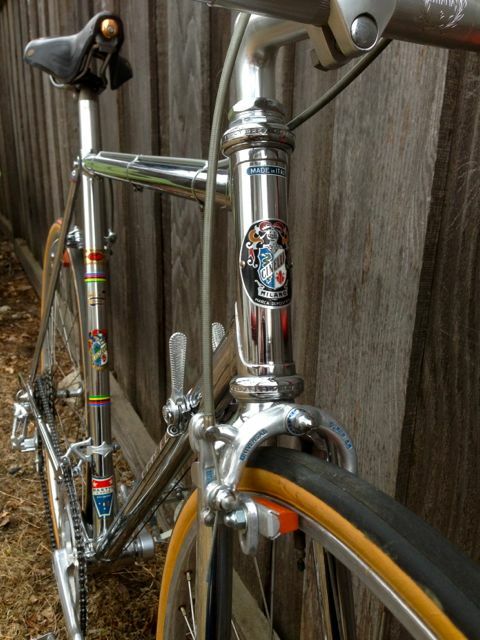 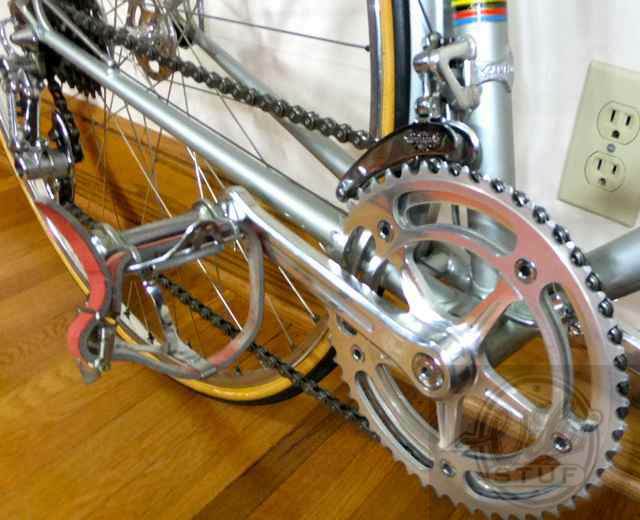 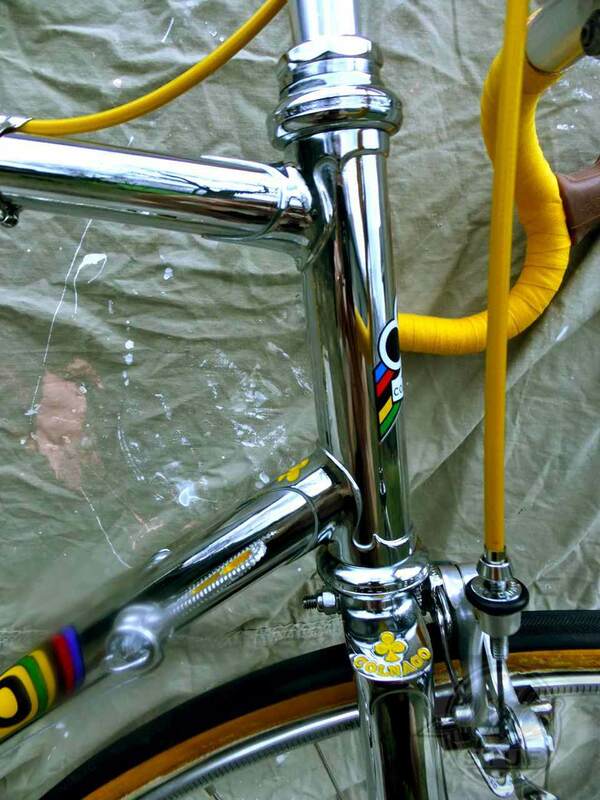 Almost new all chrome 1976 Colnago Super with rare graphics package. 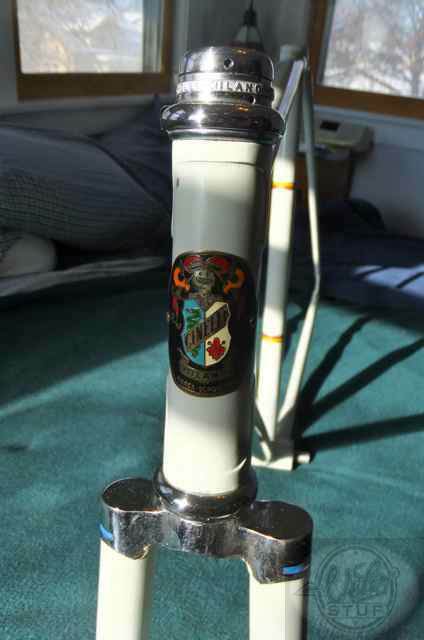 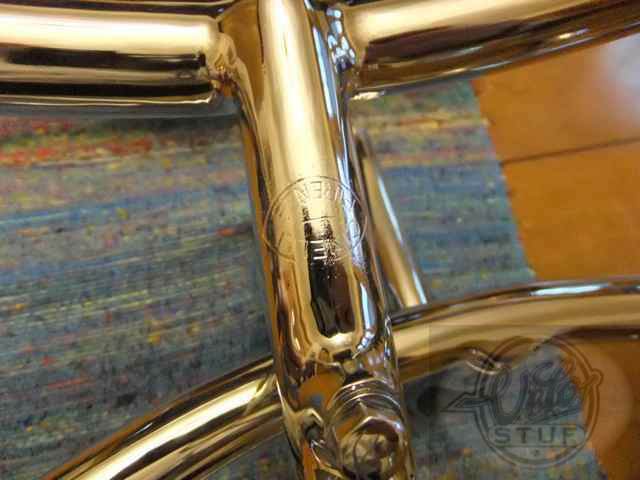 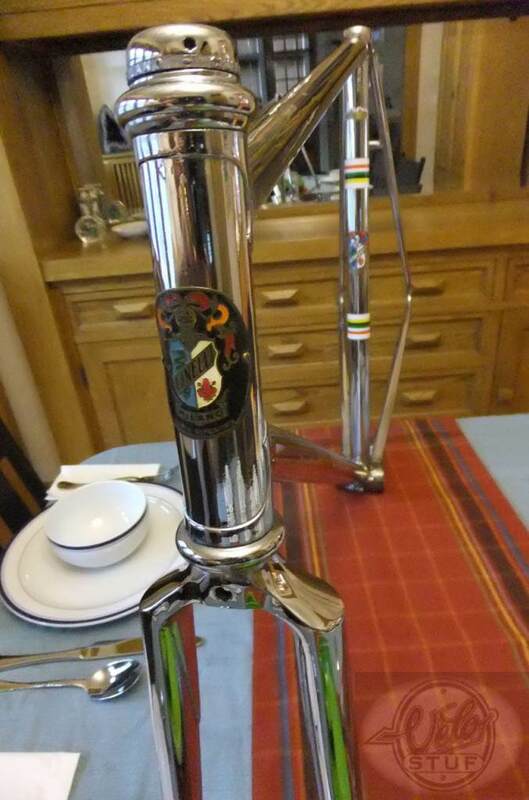 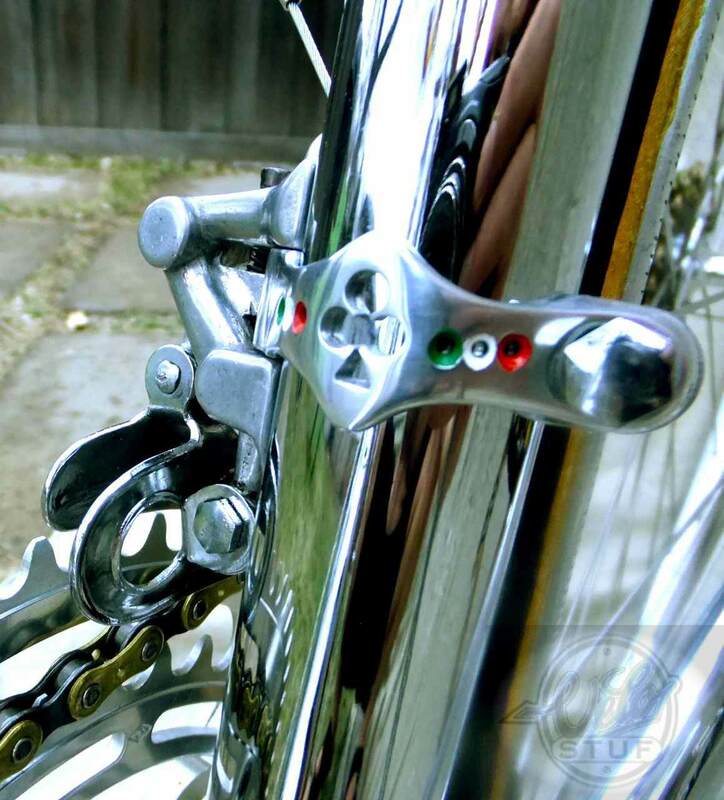 NOS chromed steel Model 17D Giro D’Italia bars, NOS chromed steel Model 1 stem, “Firenza” logo bar/stem and cloisonne badged bar/stem. 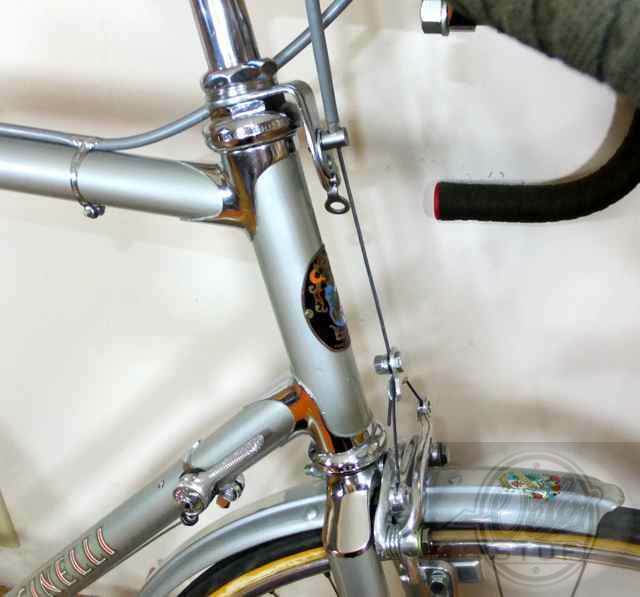 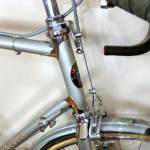 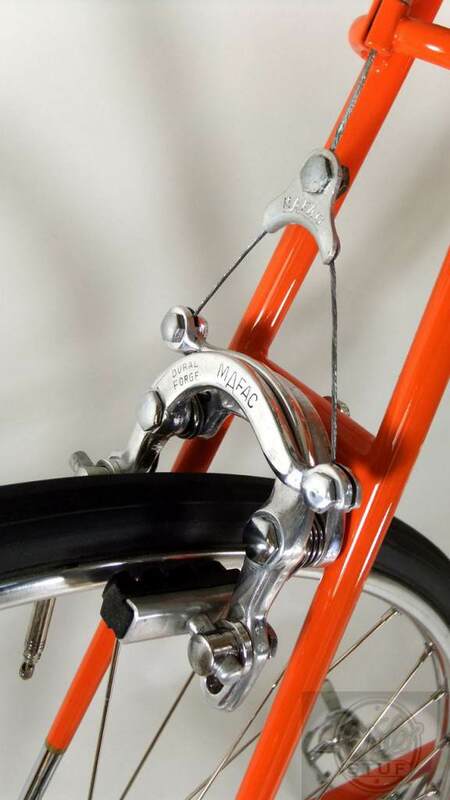 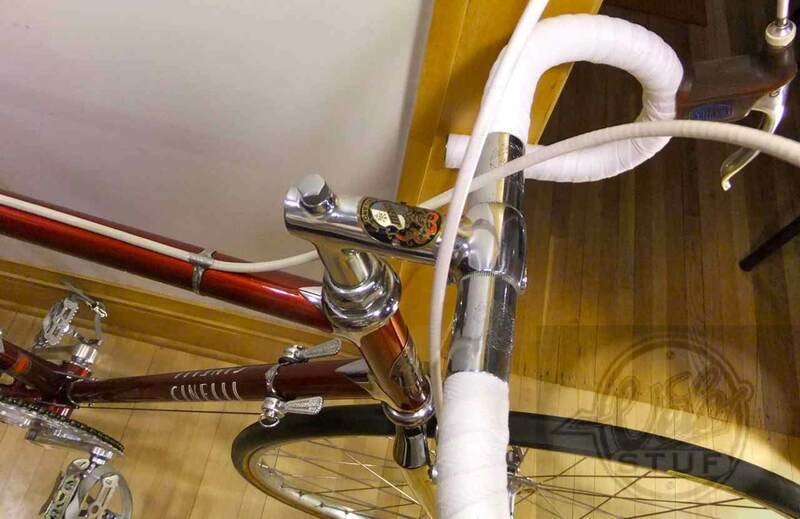 Cinelli “Tirolo” handlebars/stem from the 40’s-50’s.